So I know what you are thinking–“how the hell do you give a baby soup if they aren’t even coordinated enough to use a spoon? !” So not to burn them, I serve it luke warm. 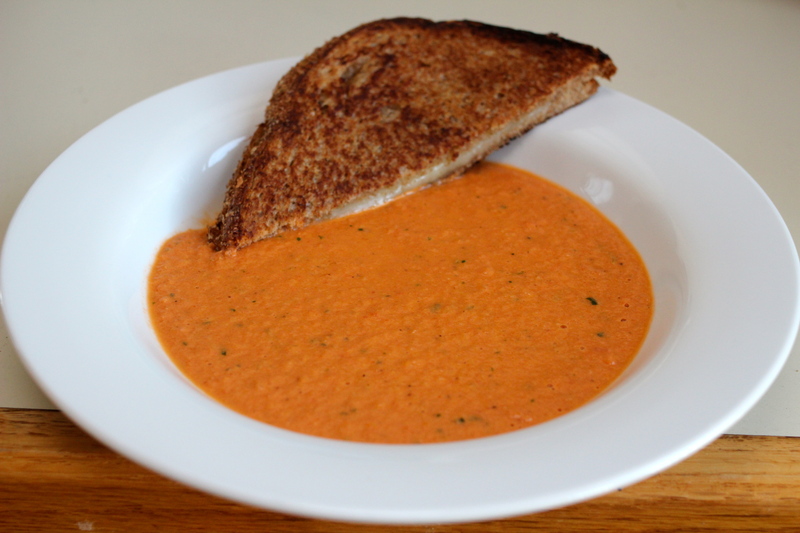 Then I give them a vehicle (other than a spoon) to help them sop up the soup; with Baby Monster, I cut up grilled cheese and add it to the soup. You can also use bread you have lying around the house, but I would toast it up first. I also put a spoon in the bowl in the off chance he will try and use it. He usually gets frustrated and sticks with his hands. This meal will get very messy–there’s no way around the mess. Just make sure you lay down a tarp on the floor, and you should probably smock up your baby too! Drain the canned tomatoes, but save the juice. In a bowl toss the tomatoes in olive oil (~1/4 of a cup) and pepper. Then spread on a cookie sheet and place in the oven to caramelize, about 15 to 20 minutes. In a large sauce pan, heat the rest of the olive oil over medium heat. Add your garlic, onions, carrots, and celery in the pot and stir around until softened. Then add your caramelized tomatoes, tomato juice, broth, and bay leaf and bring to a simmer, for about 20 to 30 minutes, until the carrots are soft. When the carrots are soft, take off the heat, remove the bay leaf, and add your cream and basil. Then take an immersion blender and blend the soup and until smooth. Add more pepper to taste.